“Energy in our Aura” As we all know, our body is made up of five elements namely fire, water, earth, air and akash. Our body has three types of energy – Satvik, Rajsik and Tamsik. An extreme positive thinker or a person who is more giving is full of Satvik energy. People who have worldly ambitions and carry style with themselves like people associated with films and glamour world would have more of Rajsik energy. A person full of negative attitude would have more Tamsik energy than the other two. In Hindu mythology, all the Gods & Goddesses symbolize these three types of energy. Brahma ji & Ma Sharde who give us intellect, peace and fame represent the Satvik energy. Lord Vishnu & Ma Shree are related with Rajgun or Rajsik energy as it is needed to fulfil our worldly ambitions which include pushivardhan or prosperity related things. Lord Shiva and MaKaali symbolize Tamsik energy, which doesn’t mean negativity and is related to the pride and self-protection of a person.. The first chakra is the Adhan chakra, where the light ofkundilini process start of a person is awakened and moves to the Sahastradhar chakra flowing through the entire body. The second chakra is the Swadhisthan chakra. This is located below the naval and above the Adhan chakra. We concentrate on this to stabilize our energy. The third chakra one is the Shakti chakra which is situated in between heart and naval. This energy helps to balance the physical diseases. The colour of this chakra is greenish red. The fourth chakra is the Hridaya chakra or anahat chakra. This is where the feelings of love and fear originate. All the fears and phobias can be controlled by taking care of this chakra. The fifth chakra is the Kanth or Vishudh chakra. As we know by its name, here the energy stays with the neck. Our word (shabd), which is Brahm, evolves from here only. Here our energy colour is bluish golden. The sixth chakra called the Agya chakra is located above the centre of our eyes in the middle of the forehead. The energy to concentrate on the materialistic or worldly needs flows from here. Its colour is mixture of orange, yellow, blue, green & red. The seventh chakra is the Sahastradhar chakra, which is located at the middle or upper part of the head. It is also calledBrahmrandra. 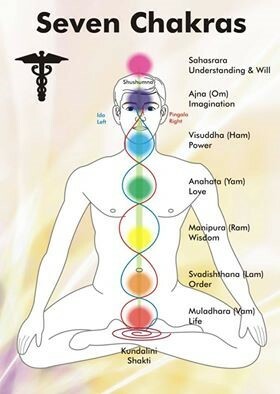 The kundilini flows from the Adhar chakra passing through all the chakras to the Sahastradhar flowing through the entire body. We feel enlightened here and we try to reach eternal light from where we had detached and came to this world.